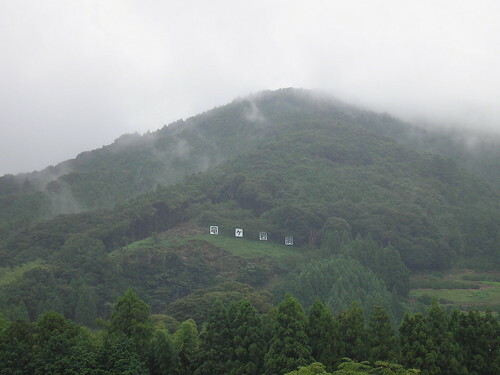 During my Obon vacation week, I was too busy spending time with my visiting mum to actually post these blogs in real-time, so I’m afraid you will have to read about my Obon week in one retrospective burst of intense blogging. I had a lot of plans for the week, including sightseeing in and around Hamamatsu, and spending a few days in Tokyo. Unfortunately, a couple of my plans were swept away in the wake of typhoon Dianmu, which decided to pay a visit to the area. Mainly affecting South Korea and China, Dianmu (which, incidentally, is the name of the mother of lightning in Chinese folklore) simply caused some really heavy rain and strong wind in Hamamatsu. Apparently it only visited Japan for about 5 hours, but that was enough to put a stop to my plans for a visit to the zoo. 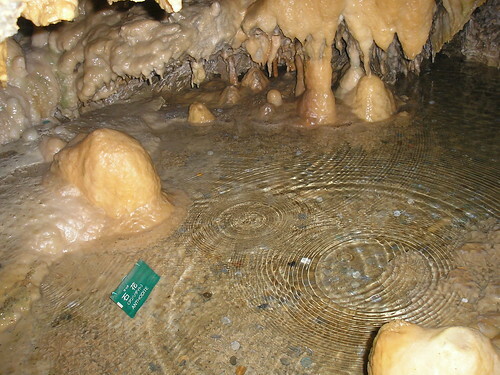 Anyway, on Monday 9th August, it was a bit of a rainy day, so my mum and I decided it was probably a good day for a visit to Ryugashi-do Caves (竜ヶ岩洞) and a bit of spelunking (that’s ‘exploring caves’, in case you didn’t know!). Reaching Ryugashi-do Caves was an adventure I felt quite proud of. I have always favoured trains over buses. I don’t know where my slight fear of buses comes from – perhaps it’s in some way related to a distant memory I have of being on a double-decker bus with my mum when I was a young child, missing our stop, and having to climb down the swaying bus steps as the bus hurtled down the road. Buses are subject to far more potential problems than trains. They don’t announce where they are, and their route is unclear. Their route can even be changed due to road works. But, actually, buses in Japan do announce where they are (usually, although sometimes just in Japanese) and, in fact, buses in Japan are pretty easy to figure out. The buses in Hamamatsu have a pretty good system whereby you take ticket as you get on the bus, and then watch the screen at the front of the bus, where the fare by your ticket number gradually increases. A few days before my mum arrived, I went to check out the buses and make a plan. 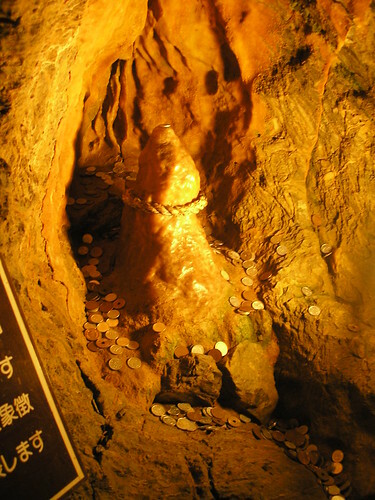 My first problem was that, although listed in the English “Traveling in Hamamatsu Handbook”, Ryugashi-do Caves were not listed in English at the bus stop. In Hamamatsu there is an extensive bus system. 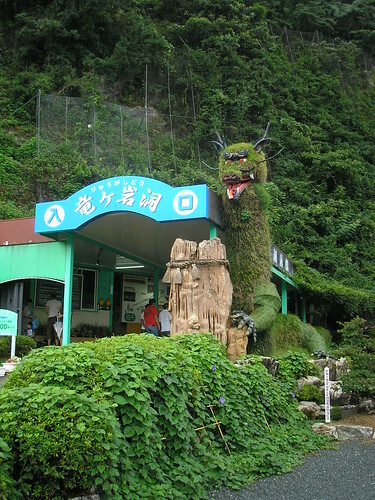 First I checked the board listing major destinations and tourist attractions, and found that I needed to depart from bus stop 15 to get to the caves. But when I investigated bus stop 15, that was where the English stopped. Eventually I managed to match the kanji and figure out that I needed the light blue line bound for Okuyama, which was bus 45, and that it should cost 630 Yen and take about 50 minutes. A later search online confirmed the timing of this journey. However, as the bus trundled along, not appearing to be delayed, and we passed the one hour mark, I have to confess I did get a little panicky. But the fare had not yet reached 630, so I reassured myself that we must be on the right bus. Eventually the announcement and display told us that the next stop was 竜ヶ岩洞入口 (Ryugashi-do Iriguchi) and, one hour and fifteen minutes after we had departed from Hamamatsu Station, we got off the bus into the countryside. Being the good little girl-scout that I am, the first thing I did was cross over the road and check for return bus times, which were twice an hour. Then we set off in the direction of the caves. It was a rainy day, but still incredibly hot and humid. Luckily, the average temperature in the caves is around 18 degrees – bliss. 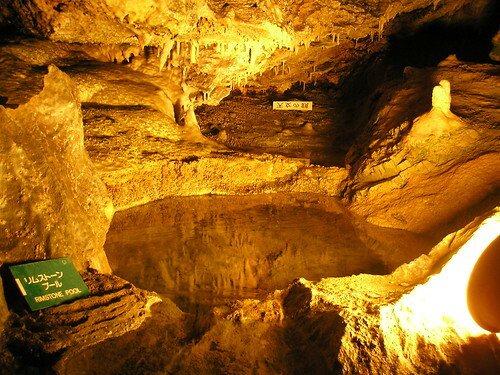 Ryugashi-do is the largest cavern in the Tokai region. 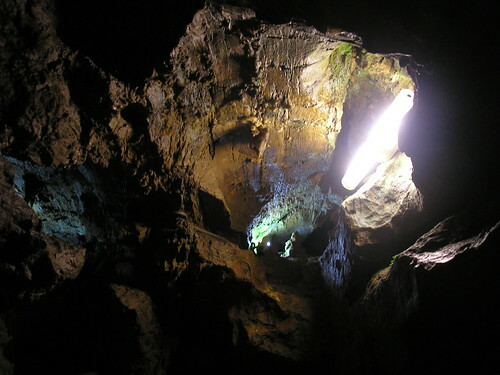 About 400 m of the 1000 m cave is open to the public. It’s a perfect example of a quirky tourist attraction which, in some ways, tries to appeal to foreign tourists but, in other ways, totally fails. There are actually a lot of English signs throughout the caves but, as I said above, they don’t make it easy to get there. 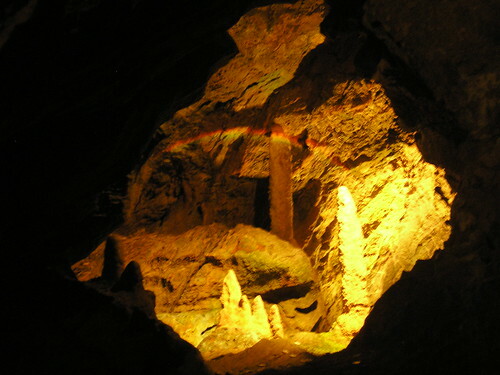 The caves have been open to the public since 1983. 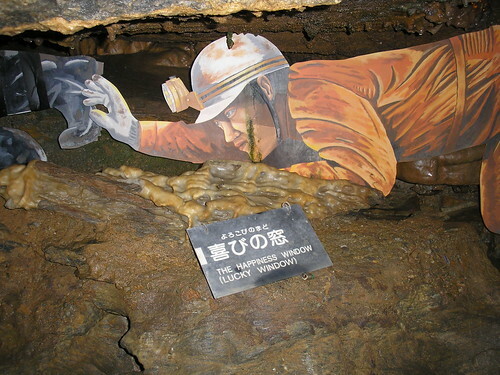 In 1981, Mr. Sadao Toda began cleaning up and excavating the caves after two amateur spelunkers apparently looked into the cave opening saying “When we go through this opening, we can find a new cave!“. I found this information on the charming English pamphlet, which you can see here. 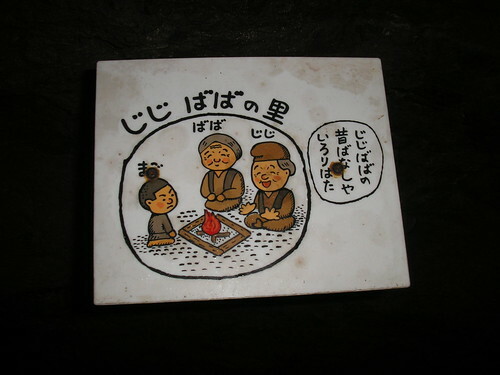 The sign below tells us that it is called　じじ　ばば　の　里, which means Grandpa and Grandma’s home. 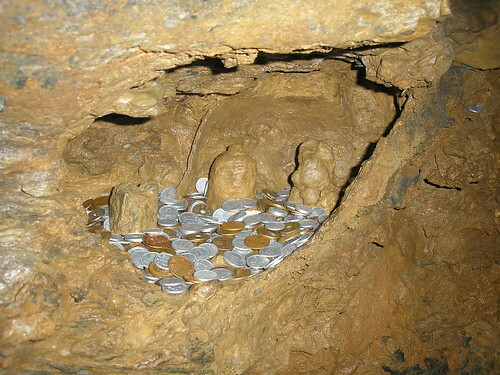 As you can see above, people have left offerings by the small family of rocks.